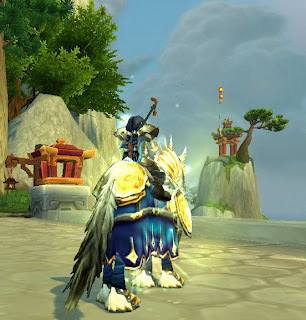 It has been one month since the release of Mists of Pandaria. I'm sure my readers may have noticed a significant slow down in posts here, namely because the game is keeping me so busy in my spare time that I just haven't had as much time to be creative. I keep an eye on other blogs, and seeing updates on others' bucket lists leaves me feeling pretty poorly. You see, I very rarely write down my bucket list, because then it becomes a "thing." You know? The kind of "thing" that MUST be completed. But this is not to say that I do not have a bucket list, I just keep it in my head. So where am I one month into the expansion? I have one level 90. Surprisingly, the character I most enjoyed playing right out of the box was my Paladin. She has her primary tradeskills maxed (enchanting and tailoring). Yes, I know, a plate wearer with clothie tradeskills, but in my defense she sat as my bank alt for several years doing next to nothing before I gave her those professions. I am currently working on faction rep with the Tillers, the Anglers, and of course the Golden Lotus. This is about as much daily questing as I can stomach at the moment. I have yet to do any dungeons or raids with her, however I did help kill the Sha of Anger once (does that count as a raid?). I occasionally have logged onto my two level 85 characters, but have not gotten very far in Pandaria leveling with either of them. I do intend to work them up to level 90, however I am having a lot of fun leveling my mage (currently level 21), a Pandaren shaman (currently level 12), and a gnome monk (currently level 10). I sometimes dabble into pet battles. My highest level team is all level 8, so I haven't gotten too far. I enjoy the pet battles enough that I'm limiting how much time I spend on them. Once upon a time fishing was my go-to wind down activity. Now it is pet battles.